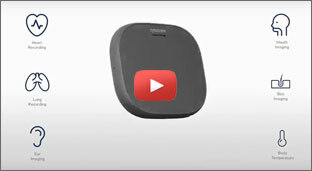 • Tech News: First Step Toward A Medical Tricorder? Don’t like exposing yourself to other peoples viruses at the doctor’s office? Tyto Care is releasing a healthcare product that enables people to easily acquire precise diagnostic medical data on heart sound and rate, lung sound, ear canal, throat and skin imaging, abdomen sound and infrared forehead temperature. This data is encrypted and sent to the person’s primary physician over Wifi and an Internet connection. A clinician receives and reviews the data, then communicates their medical opinion or diagnosis with the patient or their parent as well as any actions to be taken such as a prescription for an ear infection. Editor’s note: This tech tip is part 1 of a four-part series and covers why it is important to mount position sensors correctly and how to do it. The other three parts will be published in the next several Mechatronics Sense Newsletters. There are two parts of every shaft-type rotary (or angle) sensor that have to be mechanically attached to another partthe sensor body and its shaft. Mounting the sensor body to a surface or mounting plate needs to be done properly to avoid potential damage to the sensor for plastic body sensors and/or erratic results if the sensor body is not affixed tightly enough. Damage to the sensor and inaccuracies can result if it is not mounted on a mounting plate that is perpendicular to the axis of the shaft. • it can have threaded holes for bolts without fastening nuts. While Novotechnik provides fitting bolts in metric dimensions, usually M4 x 0.7, if stainless steel or a different length is needed, the M4 bolt can be replaced with a #8 machine screw. • Mounting torque should be not exceeded, see your specific sensor specification. • Thread locker is highly recommended, e.g. Loctite 271. The drive shaft and the sensor shaft need to be exactly on the same axis when using a rigid coupling, otherwise radial forces might be introduced by means of redundant constraints which exceed specs and might wear the sensor bearing. • The mounting screws are not designed to be used as precise locators. • Locators are documented in the User Manuals with their dimensions, usually it is a cylindrical part of the sensor housing, that fits snug in a properly dimensioned hole in the mounting plate. • Precisely dimensioned shaft collars like the ones designed into Novotechnik’s SP2800 Series angle sensors allow for perfect alignment. 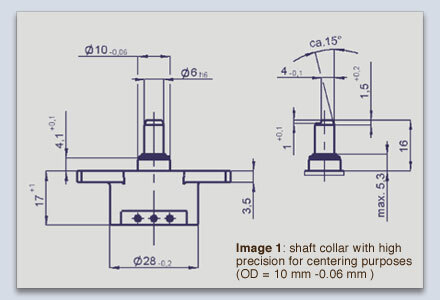 See image 1 - shaft collar of SP2800. • In cases, where a misalignment error cannot be avoided or where the drive shaft has play or has a runout error a coupling can be used to eliminate the problem. •	Elastic couplings are used for very small angle and offset compensation. See image 2. • These allow for quite a bit of radial misalignment ( e.g. 0.5 mm), however this misalignment will introduce a sinusoidal measurement error, which is easily approximated by the formula: α = arctan r/m, where α is the error angle in degrees, r equals the radius of the fork pin and m equals the misalignment of drive shaft to sensor shaft. • As an example, say the lower fork coupling has a radius of 22.5 mm. A misalignment of 0.1 mm creates an angular error of 0.25°, which equals an additional error of 0.01% using a 355° sensor. It is a good idea to design a system with a very small misalignment, if high precision measurements are required. • Last but not least, the mounting screws need to be fastened to full torque spec before the coupling set screws are tightened fully, to prevent axial bearing forces. Forget Pac-Man and Pokémon, if you are shipping products...SpeedMan® is the ‘Man’ to remember. * Sprick Corporation makes shipment packaging products. 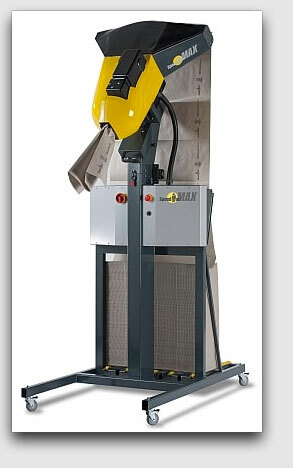 They claim their SpeedMan Max is the world’s fastest paper dispensing machine. It is used for filling voids in boxes of products being shipped in order to prevent damage to the goods being shipped. Sprick’s engineers designed it for businesses shipping large volumes of products and those that have large fill volumes. These machines dispense up to 7,600 reams of paper per minute. A ream is equivalent to 500 sheets of paper. The paper they use is 100% recycled, and can be re-recycled by the recipient of the shipped package. At the high speeds these machines operate at, insuring the machine is accurately monitoring paper output is critical. A Novotechnik RFC 4800 magnetic angle sensor/encoder is used to measure how much paper is going out. In order to accomplish this, the incremental output version of the RFC 4800 is used. A rate of 1,024 pulses per revolution is selected for this application. Pulses are continuously output, while the magnetic pick-up is revolving and not limited in count. The RFC 4800 is capable of accurately tracking revolutions at speeds up to 29,000 RPM. * All trade marks and registered trademarks are the property of their respective owners.